The plan was to have a doll and a shark crocheted and ready for Christmas morning. I managed the doll, but the shark only happened today. Meet Zoe (named on Christmas morning by the girl). She's a sweet little friend with removable flower sandals! Elena loves to snuggle with her and take on and off her shoes. I have to say that amigurumi is not my all time favorite to make. And this one definitely took a long time. Longer than expected. But in the end, I think it was worth it. Zoe truly is adorable! Now I started sharky on Christmas Eve, and finished the body and several fins, but I couldn't quite seal the deal. The entire body and all the fins were done by Christmas night, but the embroidery for the gills and mouth were preventing me from completely finishing. So in the end (today ahem), I just used a ball point pen. Had to getter done. I think it looks much better than if I had tried to embroider them. This pattern was very good and so anatomically correct. Loved it! Those are really cute!! I may have to try my hand at the shark for my little boy! 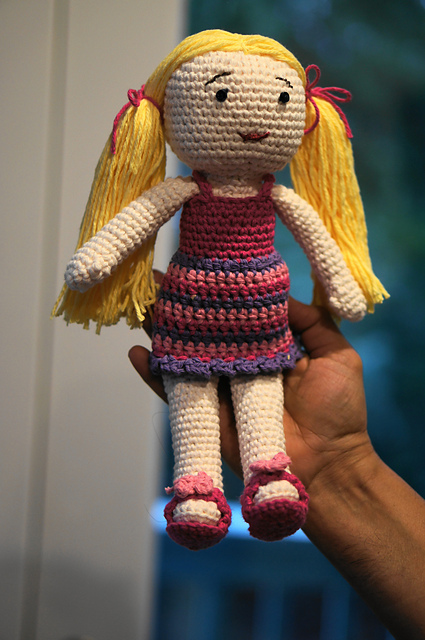 Only wish I had a little girl to make the doll for!! I have seen so many cute crochet dolls! Good job!